This is a list with all the possible Trait Cheats that are in The Sims 4 and their expansions and game packs. Because this is a very large list I created a special page for them instead of putting it with the general Cheat Code page. These Cheat Codes are all tested and working! Alluring Sims are more successful at romance than others. Sims with Angler’s Tranquility will find that all of their problems seem to melt away while they are fishing. Antiseptic Sims’ Hygiene Need decays much slower. Appraisers can sell collectibles like Metals, Crystals, Elements, and Fossils to the Simsonian Museum for extra money. Beguiling Sims can put anyone in a flirty mood with just one look. Business Savvy Sims earn more than the standard rate from careers. Carefree Sims will never get Tense. Collectors can find rare collectibles more often! Sims with a Companion have special interactions with their spouse that help ease the trials of life. Sims with Connections start all Careers several levels ahead! Creative Visionaries have a higher chance of painting and writing masterworks. Creatively Gifted Sims build adult creative skills faster. Dastardly Sims perform stronger and more successful mean interactions. Domestic Sims will see their familial relationships grow stronger faster. Entrepreneurial Sims are more likely to get promoted in their Career. 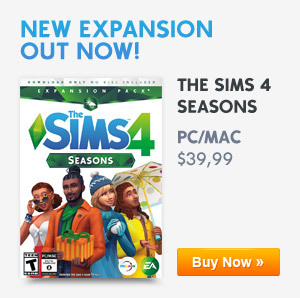 Sims with the Essence of Flavor make higher quality food and drink. Fertile Sims have an easier time when trying for a baby, and a higher chance of twins or triplets. All single use service requests are free. Fresh Chefs always make the highest quality food, and it never spoils! A Frugal Sim’s household has reduced bills. Great Kissers have amazing success with kissing, and increase Charisma with every kiss! Gregarious Sims build friendly relationships faster. Gym Rats build Fun and don’t lose Hygiene while exercising! Handy Sims can instantly Fix and Upgrade any object. Some Sims just don’t have much of an appetite. Hilarious Sims can never go wrong with a joke, and have a few extra-special ones up their sleeve. Independent Sims’ Social Need decays slower. Long Lived lets Sims live longer lives, barring any accidents. Marketable Sims sell items they’ve crafted for more Simoleons! Masterminds know just the right things to say to cause anger, sadness, and jealousy in their opponents. Mentally Gifted Sims build adult mental skills faster. Once Mentors reach Level 10 in certain skills, the Mentor interaction becomes available and they can help other Sims improve their skills even more quickly! Morning Sim build extra skill in the morning. Sims that are Naturalists don’t need to fear fire; it won’t touch them, and they can extinguish it with ease. Never Weary Sims need less sleep. Night Owls build extra skill at night. Observant Sims learn the traits of others just by meeting them. Perfect Hosts get a boost to the score of any social event they throw. Physically Gifted Sims build adult physical skills faster. Players will never cause other Sims to get jealous, no matter what they do. Potion Masters can mix potent drinks which can sway the drinker’s emotions. Professional Slackers have no fear of being demoted or fired. Professorial Sims can write helpful manuals about any skill they’re wellversed in. Quick Learners build all skills a little bit faster. Savants gain all skills much faster! Shameless Sims will never get Embarrassed! Shrewd Sims receive a direct deposit each week based on their Household Funds. Sincere Sims have more success with Apologies and Compliments. Socially Gifted Sims build adult social skills faster. Speed Cleaners tidy up much faster! Speed Readers read books faster than your average Sim. Sims with a Steel Bladder rarely have to pay attention to their Bladder Need. Super Green Thumbs will find that the plants they garden have amazing vitality! 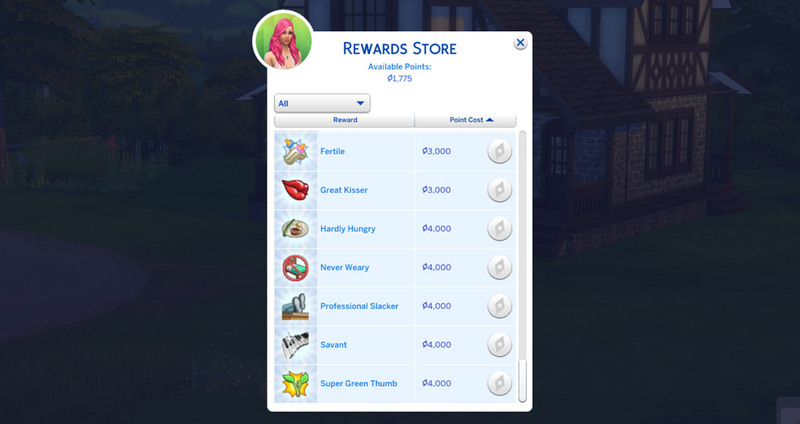 Thrifty Sims receive a 10% rebate on all Build Mode purchages made each week. Rebates will be directly applied to Household Funds. Tormentors can sabotage almost anything, be it an object or another Sim’s best efforts. By being Vicarious, your Children’s skill gains can contribute to your own! Webmasters get the most out of their computers, unlocking extremely useful ways to use them. Use the Cheat Console by pressing CTRL+SHIFT+C. Input the cheat code testingcheats true. Great Storytellers always succeed at telling bigger and better stories! Incredibly Friendly Sims are immediately liked when met with a nice introduction. Stoves and Grills Masters have a chance to create impeccable quality consumables that use stoves and grills! Survivalists are most comfortable using camping equipment and living off the land. Resilient immunity, Sims will have a lower chance of getting sick and will recover from sickness faster. These Sims become Happy when they are in their home neighborhood. Spice Hounds never find any food too Spicy, and feel Happy for hours after eating a Spicy Meal. Sims who are in the Know can get a massive discount on market stall purchases if they Haggle with vendors. From slippery noodles to tiny peas, these Sims have mastered the art of eating with Chopsticks. Leveraging their status in the art world, Critically Connected Sims receive a 20% rebate on all Art purchased in Build Mode each week. Rebates will be applied directly to Household Funds. A True Master not only excels at Mind Control Powers, they also have greater stores of Vampire Energy to call upon. I am the Master grants supernatural control. Command Powers used on Vampire Offspring always succeed. Vampires with Regained Humanity seem kinder and safer. Sims are more likely give permission to Drink. Treasure Hunters have a sharp eye and will occasionally find treasure and relics in Treasure Chests that other Sims miss. These Sims are lovers of all things ancient. They will be especially confident at museums, and even more flirty while on dates there. They also have the unique ability to donate artifacts to the Simsonian Museum. if you type “traits.equip_trait MeltMaster” you’ll be able to summon grilled cheese sandwiches. No joke. Try it. BUT WHY? WHY IS THIS A THING? Uh, can you add the ones for the normal traits? Cause you only did the reward traits/ambition traits…NOT the ones you can select in CAS. Thanks for posting this! My sim for some reason when we moved lost all of her reward traits, even the ones gotten from aspirations. This helped me get them back. Thanks! We’re really glad to hear that this helped you! Everyone remembers a Beloved Sim! Their relationships never fade. Just change equip for remove I think that is how it goes! Good luck! Is there any cheat to know all the traits of other sims without going through the pain of “get to know” a million times?? I use the traits.equip_trait Player but my Sims still get “very sad” from jealousy 🙁 I am doing testingCheats true first, it says they’re enabled but when I enter traits.equip_trait Player it doesn’t say anything and testing it failed. What is the Dance Machine one? Hi my stupid vampire sim decided to stand outside in the sun while I was paying attention to the other sim in my household so she died. Spent a lot of time on her (maxed out skills, top of the career, grand master vampire) but I cant seem to remove her death by sunlight trait. Do any of you know how or what the traitname is? I don’t think you can remove those traits, but you CAN have one of your chef sims make ambrosia. You’ll need a sim with high-level fishing skills to get an angelfish, a death flower (That you can get from build mode with bb.showhiddenobjects) and a potion of youth from the rewards store to make it. The sim to make it needs to be maxed in major_homestylecooking to be able to make it, but using cheats this takes all of three minutes. The difficult part is getting your ghost sim to eat it before anyone else does. I tried the “Traits.equip_trait Slob” on my teen sim and doesn’t seem to work, is it because only few will work on a certain stage of sims? (I did use the testingcheats true). I used the testingcheats on thing and put the spice hound cheat and the trait for it is there, but it’s not working. Is there any way to max out all traits at once instead of doing that, one by one???? HI I can’t seem to get the “independent” trait to work. I’m trying to remove this trait and i’m typing it in as “traits.remove_trait Independent”. anyone know why it’s not working? For the traits not working, here’s a tip, if it is a trait that you can add to your sim from the CAS screen (either when creating a sim or fullcasedit) it will NOT add, its stupid because you can remove them if you made the active or romantic etc., the default trait on your sim. And as for the trait independent, you have to buy it from rewards, dont ask me why, but after 10 minutes of thinking I wrote independent wrong, I went looking in the store and I had to buy it, which is also stupid because the other traits in the reward store worked with the traits.equip_trait cheat… it might just be one of those stupid glitches. “We’ve also added some new traits and powered an old one. I’ve tried removing the Independant trait using “Needs No One”, “NeedsNoOne” and “Independent” without success. I’m having trouble removing the “Shameless” trait, “Independent” trait and “Animal Whisperer” trait. For the first two the cheat name listed above won’t work. I’ve even tried Copying and pasting. And nowhere can I find the cheat name for “Animal Whisperer” (unlocked by completing friend of the animals aspiration) . Does anyone know what I need to do? Anyone knew what is Temporary Genius is ? I couldn’t found it. Hey, Does this work on the vegetarian trait? Can’t get it to work! “Independent” is not the command name. The poster just made it up. Cant seem to remove Heat Acclimation, Please help!